When buying land or a house in Bridger Canyon it is important to consider water well flow rate, well yield, and water quantity. The ground water resources for the Bridger Canyon area of Bozeman are controlled by the Gallatin Local Water Quality District(GLWQD). Homes in Bridger Canyon are not connected to Bozemen City Services for water. Most properties rely on private wells, although there are a few homes that utilize underground springs. Drilling wells that supply adequate flow rate are not typically a problem, although there are a few areas of Bridger Canyon where flow rates are low, and the occasional a well goes dry. Please contact us to explain the areas where water is more difficult to find. 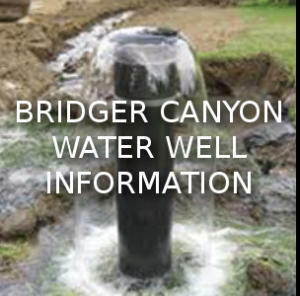 For real estate in Bridger Canyon the most common well water measurement is Gallons Per Minute. The Federal Housing Administration (FHA) requires 3 to 5 gallons per minute for older wells and a rate of 5 gallons per minute for new wells to pass inspection. The average American household needs 100 to 120 gallons per person per day, and a flow rate of about 6 to 12 gallons per minute. This requirement may be higher if the well serves a home housing a large family or there are large water demands for a large lawn or garden. 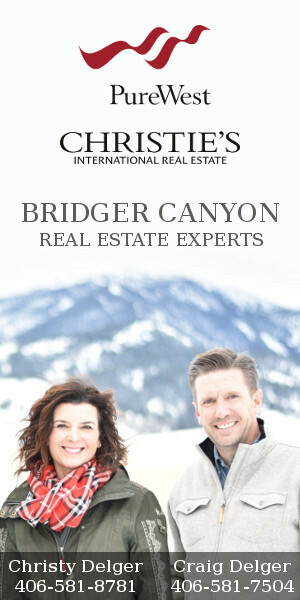 Bridger Canyon is fortunate in that most areas have highly productive wells. Private residential wells typically exceed 15 gallons per minute, and can go above 30 gallons per minute, although additional permits are required for wells exceeding 35 gallons per minute. Water capacity for wells in Bridger Canyon is another consideration. There are a few different ways to look at the amount of water in the well. The first is water storage capacity. A standard 6-inch diameter drilled well can store 1.5 gallons of water per foot. If you know the depth of the well, the level of the water and pump depth, you can figure out the water storage capacity. Most people don’t know all of this information, but it can be figured out by consulting with a water system professional or by looking at a well log. Minimum water supply capacity for use inside a home should be at least 600 gallons within a two-hour period, or about 5 gallons per minute for 2 hours. Some homeowners may find this recommended amount to be less than they ultimately need depending on the size of the family or if there are large outdoor water demands. This is also something you can discuss with a water system professional. What Can Be Done If A Well Underperforms? If after conducting a flow rate test, the well does not meet the recommended standards, there are some options to increasing flow. If there is space on the property, another well can be dug. This is costly, time consuming and may not get the results the homeowner needs. Existing wells can be improved by a process called hydrofracking, which blasts water into an existing well bore to clear debris and open fissures allowing water to flow through the bedrock. Hydrofracking does not use chemicals and is different from the hydraulic fracking associated with the oil and gas industry. In addition, if a well produces below the flow rate that your family requires, a holding tank(typically 500 gallons) can be installed with proper controls on the well to keep it from pumping dry. The holding tank will provide the amount of water a family needs during peak usage periods(running dishwasher, sprinklers, and a shower at the same time). This usually is sufficient to support a family. The last consideration is water quality. When purchasing or maintaining a property with a private water well, it is a good idea to get the water quality tested. This can reveal any contaminants that are a health risk, and also water contaminants that are not a health threat but which are aesthetic or even functional concerns such as color, sediment, water hardness, or water odors. Much of the ground water in the GLWQD is considered hard because it contains a high proportion of calcium and magnesium. The hardness of water is expressed as a percentage of calcium carbonate, which is the principle constituent of limestone. Water is considered soft if it contains 0 to 60 mg/L of hardness, moderately hard if it contains from 61 to 120 mg/L, hard between 121 to 180 mg/L of hardness, and very hard if more than 180 mg/L of hardness. Hardness of ground water of the GLWQD ranges between 6 to 340 mg/L. If you intend to use 35 gpm or less, and are not in a Controlled Ground Water Area, you are not required to obtain a permit, but you must file a “Notice of Completion of Groundwater Development” (Form 602) with DNRC within 60 days after you begin using the water. If you intend to use more than 35 gallons of water per minute or 10 acre-feet in volume per year, you will need to apply for a “Beneficial Water Use Permit” (Form 600) from the DNRC in order to legally use the water in the well. 10 acre-feet is equilavent to 3,258,514 gallons of water. To put this in perspective, a single well operating within the 35 gpm and 10 acre-feet restrictions can support 90 – 178 people consuming average household water amounts.